3 Do You Absolutely Need Whey? 6 Other Places To Get Whey Protein? Whey protein isn’t missing from the discussions around the water-cooler at any gym. It has quickly made its way to the top of the must-have bodybuilding supplements list and most people don’t realize that it is relatively new to the supplement game. It has only been recently (the glorious 90s) that the technology existed to effectively filter out the whey protein and create the supplements athletes have come to know and love. Whey has definitely been a welcome addition to the bodybuilding world and has surely helped many trainers move towards their goals. In the muscle building diet, it is often the relatively high levels of prescribed protein consumption that trainers have a difficult time achieving. Whey protein powders offer a quick and quality protein source to bodybuilders. They also come without the high saturated fat content that often accompanies other complete protein sources like beef and eggs. number one benefit of these powders. Whey is one of two major sources of protein in milk (casein protein being the other). When milk is turned into cheese, the whey protein is filtered out. The result is a high quality protein. Whey protein is very easily digested and utilized by the body. Biological Value (BV) is a term you will see used often with regards to protein powders. BV is a measure of the efficiency with which protein can be absorbed and utilized by the body for tissue growth – the higher the value the greater the efficiency. Egg protein is the standard for BV as it was tops when the scale debuted. Egg protein has a BV of 100. Milk (casein and whey) comes in at around 85, beef proteins around 75. Whey protein supplements in the concentrated form have a BV of around 104 whereas whey in an isolated form can have a BV approaching 170. This demonstrates one reason why whey creates such a fuss – it is a very efficient protein. Don’t get hung up on BV values though, they are not the end-all and subject to misrepresentations that the supplement companies don’t hesitate to exploit. Whey protein is rich in the amino acids that are critical to developing and sustaining new muscle mass. The most cost-efficient and possibly overall effective way of supplying adequate amounts of these amino acids is by way of whey protein supplements. Amino acids are chains of nitrogen containing sub-units that make up a protein. They determine whether or not a protein is complete. To be complete, a protein must contain all of the essential amino acids. The essential amino acids cannot be made by the body and therefore must be supplied by diet. A good whey protein supplement will be an excellent source of essential amino acids (it is a complete protein) as well as providing appreciable amounts of non-essential and conditionally essential amino acids. Perhaps more important to the person trying to gain weight and muscle is the ability of whey to deliver branch chain amino acids (BCAAs). Whey contains more of the BCAAs then any other protein source. The BCAAs are leucine, valine and iso-leucine. More important than the scientific names is the fact that the BCAAs make up a third of the amino acid profile in muscle. Within muscle, BCAAs have the important job of assisting in the synthesis of other amino acids required for building including the important glutamine. Whey can have a positive impact on the bodybuilder’s immune system. Weight lifting creates stress on the body and if not nutritionally countered, it can weaken the immune system. This can mean an increased occurrence of minor health maladies such as sore throats and can even open the door to more serious problems. Whey has been shown to have the ability to raise levels of glutathione. Glutathione is a small molecule that is found in every cell and is the major antioxidant produced by the cell. Its importance to the immune system cannot be overstated. Do You Absolutely Need Whey? Looking at the above potential benefits that can be attained from whey protein supplementation (and these are just a few), it is easy to see why it is so popular. Add to those benefits the aforementioned convenience factor and a reasonable price tag and you really have an amazing supplement. But don’t get trapped into believing whey is something it isn’t. The supplement companies are hard at work trying to get you to think their whey products are indispensable, that they are “everything” to the muscle building process. They aren’t. Whole food sources always offer you the preferred option of acquiring your nutrition. Consider that a law. A quality liquid whey protein source, however, can challenge that law when it comes to post-workout nutrition. You will digest it faster and therefore increase the speed at which your muscles are refueled in this critical time. No other protein source can so rapidly deliver amino acids to the blood and positively affect protein synthesis. Due to this ability, whey may be able to lay claim to being the most valuable protein for muscle building. However, slower proteins have value in the muscle building process as well. A protein that is absorbed slower allows for greater quantities of nutrient absorption. In this way, slower proteins can have a greater anti-catabolic effect than whey. With the goal being to build more muscle than you lose, a combination of protein sources in a balanced diet will be ideal. This tuna feels that his role in the ideal muscle building diet is secure despite all the whey protein hype. Soy, milk, beef, fish, casein and egg (especially egg proteins) all provide benefits to the person wanting to build muscle and gain weight fast. Different proteins provide different amino acid profiles and this diversity helps keep the body in a proper (anabolic) state. As far as supplementation goes, a supply of whey is all you should need in terms of specific protein supplements. Concentrate on getting your other proteins from whole food sources and using your whey protein powder to achieve your daily protein goals (1-2 grams protein daily per pound of bodyweight) and for use in post-workout nutrition. With the unwelcomed help of the supplement manufacturing companies marketing departments, picking a whey protein supplement can be confusing business. Naturally, all claim their product to be the best and cite reasons to support their claims. The truth is, there isn’t as much of a difference as they would like you to believe. Like all supplement purchases, whey protein supplement purchases should be guided by the selection of a reputable and quality manufacturer first and price second. Isolates have the highest BV of the whey protein supplements. With BV values up above 150, isolates represent the height of protein efficiency. They are ideal for use in the morning when your protein levels have been depleted due to sleep as well as in pre and post-workout nutrition. 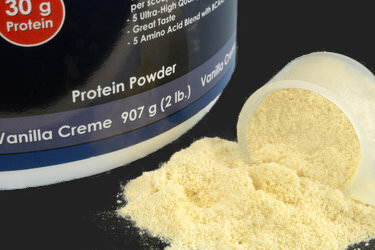 Concentrates offer your best value in whey protein supplementation. Generally, concentrates include some isolates as well as ion-exchange and hydrolyzed proteins to bring up the protein content. They have a BV value of around 100. Isolates are your best choice if cost is not a factor and your protein needs aren’t excessive. The benefits isolates have over concentrates probably does not justify their additional cost however. Quality isolates will cost about twice as much as quality concentrates on a per gram of protein basis and a quality concentrate is still a high quality protein added to your diet. No one will explode in muscle growth by switching from a concentrate to an isolate. Your goal should be simply to meet your protein needs in the most reasonable way possible and leave the BV talk and other protein measurement systems to the marketers. Buy at reasonable cost from a quality manufacturer. If you find your weight gain diet needing a bigger protein boost from supplementation, you may want to consider a whey blend. Blends combine whey with different types of protein in order to allow more of a shelf life in the stomach. Blends offer higher amounts of usable protein on a per serving basis and cost a little more than concentrates but a little less than isolates. Other Places To Get Whey Protein? You get whey from all milk products. About 20% of the protein in milk is whey (the rest is primarily casein). With the popularity of whey, expect to see many products continuing to alert you to the fact that they contain whey (always look to see just how much). You will also find whey protein in quality meal replacements, weight gainers and other supplements. What it is, what it does, how it benefits the athlete, the research that backs it up and how to best put it to use.